Helping spread awareness about the FD and the services it provides for York Region, as coverage from the media goes a long way. This helps the public know what we do with used furniture donations and how the FD functions as a furniture bank helping those in need. While vast, this blog covers some of the highlights where the FD has been featured in the media over the past few years. CBC News -January 11,2016 (24:31) – The FD helps Syrian refugee families settle in Canada by providing furniture to help furnish their homes. Thornhill Liberal (on YorkRegion.com) -January 14, 2016 – The FD helps refugee families furnish their homes. Canadian Jewish News (CJN)- December 21 2017– An article describing how the FD helps individuals and families in need across York Region and Toronto. The FD is thankful to these media outlets and others who featured its services to York Region and Toronto. We look forward to helping the needy of York Region and Toronto for many years to come – but we still need YOUR help! Donate used furniture today! Schedule a pickup and help those in need. With the diverse clientele the FD services within Toronto and York region, it is worthwhile noting that we are committed to ensuring that anyone referred to us has accessibility within our facility- regardless of the limitations they have. Furniture donations are helpful only if it’s made accessible to all our clients! This blog post is about accessibility at the JRCC FD and how the FD provides it. The JRCC furniture depot receives referrals from ODSP and Ontario Works to assist clients in need. The FD thus accommodates for challenges with accessibility faced by clients referred by these organizations by providing a fully accessible facility. Saying that our facility fully is accessible sounds like a big deal; let’s talk about the accessibility options the FD provides. Outside the FD a door-push button is provided for those who are unable to open the door. Take the Stairs or the Elevator? While the stairs may be a healthier option for some, for others it presents a challenge. With this sensitivity in mind, an elevator has been installed to provide ease of access to the facility for all clients visiting the FD. Yes, ALL STAFF. To assure that we can accommodate for all clients regardless of their disability, staff at the JRCC furniture depot were required to complete the Accessibility for Ontarians with Disabilities Act training course (link: here) as part of their employment at the FD. To provide accessibility to the showroom, access to the showroom from reception is sans-stairs and entirely wheelchair accessible! This assures that all clients will be able to see the furniture donations available and will be given fair opportunity to select the items they are interested in. While it sounds hard to believe, “seeing is believing” at the FD. If you or anyone you know wants to donate used furniture, call us up at 416-222-7105 ext.500 or email furniture@jrcc.org for your furniture pickup quote today! In our “schedule a pickup” form we ask for your contact information, address and housing type; we need all this information before we can generate a pick-up quote because we need to know who you are, the location of your furniture, where to email your pick-up quote, which phone number you can be contacted, well as the quantity of furniture and the type of building our movers will be picking up from. Sometimes, if furniture is larger than usual, we may ask for pictures to be emailed before generating a quote. Our furniture pick-up schedule varies throughout the week and the given month. It is therefore highly recommended by potential furniture donors to call at least 2 weeks in advance of the approximate date they would be interested in donating their furniture. Also, please note that the JRCC Furniture Depot only services a given area in the GTA, please assure that your furniture is our service area before calling to schedule a pickup! In order to generate self-sufficiency, the JRCC Furniture Depot has to charge a nominal fee for furniture pickup. Potential donors are sent a quote with their pick-up fee and donation value which they will receive a CRA approved tax receipt. Additionally, we apply discounts for larger quantities of furniture donated! So, the more you donate the more you save! After a quote is sent, if you are interested in donating your furniture, we schedule a pick-up date which works for you! After mutually agreeing on a date which works, we bill you via credit card for your furniture pickup and schedule you in for an agreed pick-up date. Because our movers work on a day to day basis, we are unable to schedule pick-up times for typical donation. Times for furniture pick-ups are only known the day before after 12pm. After 12pm, furniture donors will receive a call with a 3-hour window when our movers come for pick up. Step 4: Within 90 days, a tax-deductible donation receipt should come in the mail. After your furniture is picked up, our accounting department should mail you a donation receipt for the value your furniture is evaluated in the quote. Thank you for donating to the JRCC Furniture depot! Thank you for making a difference in someone else’s life! During the festival of lights, the JRCC Furniture Depot continues to work to provide clients in need with what everyone needs to see when they come home- furniture. During this time, not everyone in the GTA is fortunate enough to have what is basic in every home. While clients referred to us are lacking furniture such as a table to eat on, a chair to sit on and a bed to sleep on- soon after an appointment with us they can rest assured knowing that their homes will be well furnished in the a next few days when the furniture they selected from our showroom is delivered. All this could not have been possible were it not for the help of our donors! The furniture donated by our donors is the same furniture which furnishes the homes of the clients referred to the JRCC Furniture Depot. However, with the increasing number of clients being referred to the Furniture Depot, our operating costs have also increased. We need your help to bring the light to the homes of people in need. An in-kind tax receipt will be provided for all donations to JRCC. The JRCC Furniture Depot presently services an area spanning from Lake Ontario to Lake Simcoe. With such a large area to service, we are presently looking to partner with hotels, furniture stores and property developers looking to do something meaningful with the furniture that they will no longer be using. While being socially responsible, companies can take pride in knowing that their furniture donations will be environmentally responsible, and that their furniture will go straight to the homes of needy families in York Region. We have a fixed pickup charge – As opposed to standard moving companies, which charge by the hour, the JRCC furniture depot believes that furniture pickup services should be as efficient as possible – saving our time and yours! We provide an in kind tax receipt for donated items at fair market value – Instead of calling a junk removal company, which will simply charge for pickup and send your furniture to a landfill, furniture donations to the JRCC furniture depot will be given a tax receipt evaluated by CRA standards. The more you donate, you save – Often, furniture donations for many items can add up to a high pickup cost. To help reduce that, the JRCC furniture depot applies price reductions to pickup quotes with high volume of items – but the tax receipt stays the same! We have special offers for repeat donors (for companies) – Businesses like hotel chains and mattress companies interested in donating to JRCC on a recurring basis should contact us directly for corporate sponsorship opportunities. A lot has changed since 1985 when the JRCC Furniture Depot started as a service connecting those who wanted to donate their furniture with those who needed it. We are proud to say, the JRCC furniture depot services all clients regardless of their race, religion or color! We are proud to service the Greater Toronto Area (GTA) and help those in need of a basic living necessity- furniture. Having a bed to sleep, a chair to sit and a table to eat is essential to have for anyone seeking to improve their lives- and we want to have a part in helping them! In 2017, 90% of clients served were below the poverty line, 60% were newcomers to Canada, 60% had minor children and 20% were transitioning from shelters! Those donating their furniture to the JRCC furniture depot can have peace of mind knowing that their furniture will make a difference in someone’s life. A difference which will improve the lives of others, a difference which will affect the entire GTA for the better. Just walking through our warehouse can show why are clients come here. Mattresses, dressers, tables, chairs and couches- the basics in any home – are what we provide for clients. 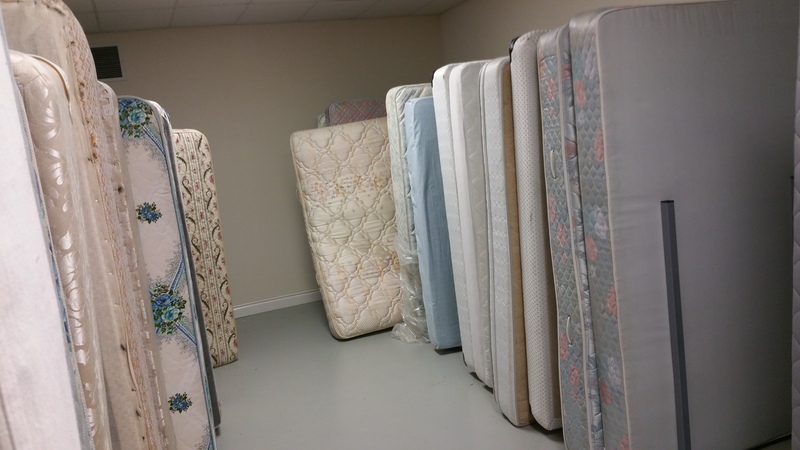 Most of the time, when a client is referred to the JRCC Furniture Depot, the first thing taken is a mattress. By helping those without furniture furnish their homes, we can help them have the peace of mind knowing that they have a place to put their head down. The JRCC Furniture Depot is a service provided to help those with limited means to furnish their homes. Since it’s founding in 1985 as a humble community service making connections between people who wanted to donate their furniture with people who needed it, the JRCC Furniture depot has expanded to become a central community service which helps those in need furnish their home and picks up furniture from those donors! Fast forward to 2017- the JRCC Furniture Depot has become a community service which has had partnerships from more than 60 referral agencies and has been working with over 200 case workers to help service York Region better- and is still growing! In 2017 alone we helped 2,250 clients and gave away 5,902 furniture items!! Aside from servicing a large volume of clients in need at the JRCC Furniture depot- we believe that every client deserves respect and confidentiality when they come to us in their time of need. In fact, our evaluation data from 2017 shows that for client satisfaction we scored 3.8 out of 4! In addition to assuring satisfaction with our clients, we work hard to make our donors happy! Our 2017 evaluation data revealed that we scored 3.9 out of 4 for Donor satisfaction! While these numbers are great, we are always trying to help more in need of furniture and are always looking for furniture to help furnish more homes! If you are interested in donating your gently used furniture, don’t hesitate to call us up at 416-222-7105 ext. 248. If you are in need furniture, have your social service refer you to us and we would love to help! Visit our new page at Viva Next website!